Most data centers utilize HVAC systems to pump pressurized air to maintain a server inlet temperature within the proper temperature range – ASHRAE recommendations for class A1 devices (enterprise level, mission critical, servers) specify an upper inlet temperature of 89.6 deg. F (32 deg. 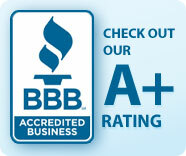 C) and relative humidity of up to 80%. These CRAC / CRAH solutions usually provide air under raised floors, but above floor solutions are also available. Cold Aisle Containment augments its predecessor’s (hot aisle/cold aisle) arrangement by enclosing the cold aisle. The aisle then becomes a room unto itself, sealed with barriers made of metal, plastic, or plexiglass. As rack densities inevitably climb, the challenges above become more severe. The infrastructure struggles to deliver a sufficient volume of cool air to the equipment and to move exhaust air to the air handlers. As it’s forced to deliver colder air at a greater CFM, the cooling scheme consumes more energy from the fans through the pumps, down to the chiller. And even under minimal loads, the efficiency of these systems is suspect. The premise of cold aisle containment, though simple, can improve cooling performance. Diagram of a Data Center with Bypass Air problems (mixing of hot and cold air) – a very common cause of power loss. Bypass air-“the volume of cold supply air that enters the room but does not directly enter the IT equipment”-limits the precise delivery of cold air at the server intake. Hot air recirculation, where exhaust heat enters the cold aisle, either over the tops of racks or through open rack spaces, ensures that the cooling infrastructure must throw colder air at the equipment to offset this mixing. Cold Aisle Containment started as a makeshift design using the vinyl curtains common in clean rooms and freezers. These curtains, functioning as doors and roofs between the cold aisles, proved an inexpensive way to increase efficiency and a simple, flexible retrofit for most data center environments. As more data centers embrace the concept, some rack manufacturers are bringing their own cold aisle containment systems to market. The barriers, instead of curtains, are fabricated from steel and use polycarbonate inserts to provide a viewing window into the cold aisle. The same rack manufacturers, in new construction or renovation projects, may promote the use of containment with In-Row air conditioners. These units, more compact, are embedded within the row of server racks, immediately capturing server exhaust air, conditioning it, and distributing it to the cold aisle. Due to the open architecture of the data center room, hot aisle/cold aisle cannot attain complete air separation. With the cold aisle encased, the cold air, delivered from under the floor, stays where it’s needed at the server intake. The roof and walls of the containment ensure that the only place this air can exit is through the rackmount equipment. The exhaust air, because of the boundaries, routes back to the air handlers only, eliminating the previous concerns of hot air contamination and hot air recirculation. If there’s adequate capacity in the central plant, cold aisle containment can harness that capacity to support higher density cabinet installations. With mixing out of the equation, the system can focus on cooling the load instead of the entire room. As a result, data center professionals have a more predictable system-a consistent server inlet temperature, within ASHRAE ranges, unaffected by the higher server exhaust temperature. A server cabinet manufacturer, in testing, successfully rejected 20kW per rack with its cold aisle containment system, using a server inlet temperature of 65 degrees, Delta T across the servers of 45 degrees F, and 65% perforated floor tiles. 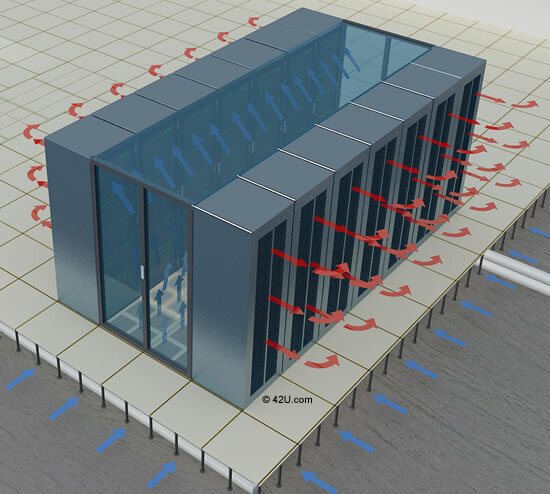 A case study at the 2008 Silicon Valley Leadership Group, entitled Air Flow Management, advocated containment as a viable high density solution but stopped short of giving a range of cooling capacities. Efficiency strategies often discuss Delta T (ΔT). The topic is especially significant with computer room air handlers for an “elevated return temperature…to the cooling unit enables better heat exchange across the cooling coil, better utilization of the cooling equipment, and overall higher efficiency,” as APC White paper #135 states. 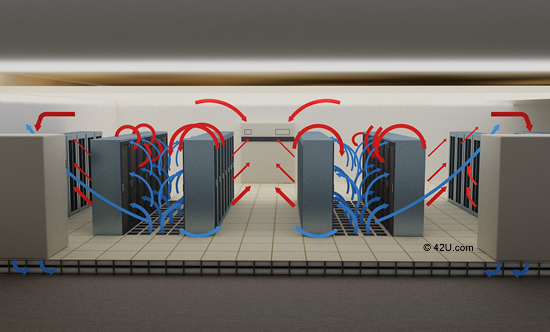 Cold aisle containment, through its boundaries, ensures that server exhaust air is not unnecessarily cooled before it returns to the air handlers. By improving the heat exchange across the coils, the containment maximizes the capacity of the entire air conditioner. In an existing facility with numerous computer room air conditioners, perhaps this means installing Variable Speed Drives (VSDs) to ensure fan speed matches the load or even turning off unnecessary air conditioners. As a result, the facility consumes less energy and the organization saves money on the smaller electric bill. ASHRAE recommends server inlet temperatures between 64.4 deg F and 80.6 deg F. Chillers typically produce chilled water around 45F degrees and inlet air around 58F degrees. This disparity exists, again, because of air mixing within the data center. As inlet air and exhaust air interact, the hope is the resulting inlet temperature falls somewhere in the ASHRAE recommended range. Through containment, a user can eliminate this uncertainty. If he desires a 68F degree inlet temperature, perhaps he can achieve it with 58 degree F water. The warmer the water, the more efficient the chiller operates. An EYP study compares a California facility with a 45 deg F chilled water setpoint to a 55 deg F alternative. The test approximates an annual energy savings of over $388,000, based on a utility rate of $0.10/kWH. This figure is both compelling and ambiguous, for it’s not practical for every data center to simply raise their chilled water temperature. A thorough analysis of the cooling scheme is needed, especially if the central plant serves a mixed use facility. A facility in the design stages, using cold aisle containment, may require less air conditioners, reducing the initial capital expenditure. An existing facility with thermal challenges may be able to maximize the entire cooling infrastructure through containment, instead of undertaking a long, costly renovation or construction project. Depending on the location, a facility may receive rebates or incentives from its utility for deploying cold aisle containment. If so, users may demonstrate a quick ROI to their management team. The current economic climate may delay an organization’s ability to build a new data center. As a result, they will demand more uptime and more computing capacity from their existing facilities, while the industry encourages conservation and sustainability. Cold Aisle Containment proves an economical way to achieve both objectives.